A newly wed woman, Babita, was seriously injured in a massive blast in New Nanak Nagar of the Salim Tabri area where crackers were reportedly being manufactured illegally. The police had recently registered a case against the house owner, Ricky in this record. 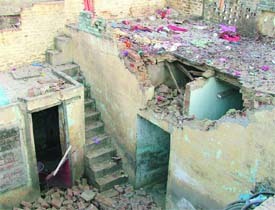 The damaged roof of a house in the Salim Tabri area after a blast took place inside the house where crackers were allegedly being manufactured illegally. Dr Indu Malhotra, SDM, Malerkotla, has imposed restrictions on the sale and storage of crackers in the town and its surrounding areas, including Dhuri, Malerkotla and Amargarh. Peeved at the Municipal Council President's action of disallowing entry to some councillors at a meeting, the agitating councillors ensured that no business of the council was conducted or estimates approved at a meeting. There has been great resentment and public outcry against the steep hike in the prices of petrol, diesel and LPG. The Rs 20 per cylinder hike seems to have irked people the most. The common man feels that the government had deliberately delayed the hike in view of the Assembly elections in Maharashtra. 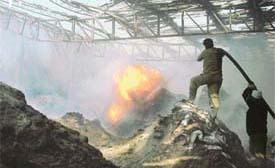 Goods worth lakhs were destroyed in a fire that broke out in a godown stocking mosquito repellent coils at Khasi Kalan village, near here, today. The state government is learnt to have taken a serious view of the construction of commercial buildings in the designated residential areas in the mega city and the civic body has been asked to submit a detailed list of the commercial buildings that have come up in violation of the building bylaws in the recent past. Jaagar Singh, 92, was thrown out of his house by his son and daughter-in-law six months ago. Since then he has been living on a footpath near local Fountain Chowk. A blanket continues to be his only protection from cold. 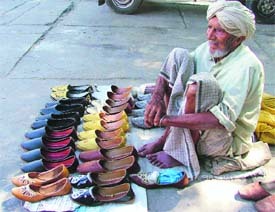 Jaagar Singh earns his dal-roti by selling desi jutties. Whatever he earns is enough for his tea and food. Punjab Vigilance Bureau, Jalandhar Range, DIG Ishwar Chander has urged people to cooperate and assist the bureau in checking corruption. He was addressing a district-level seminar on corruption “Sanchetna” organised by the bureau at Arya College here today as part of the ongoing Vigilance Awareness Week, which began on November 1. Activists of the Uttariya Railway Mazdoor Union while charging the functionaries of Northern Zone Railway Employees Society with financial irregularities have served an ultimatum on them in this regard. They threatened protests and agitation if the latter failed to follow suit. At least 27 employees at various government offices here were found absent on Wednesday during a surprise check conducted by a team of the SDM’s office, Malerkotla. Lok Sabha Deputy Speaker Charanjit Singh Atwal has exhorted Punjabi NRIs to make liberal investments in the industrial, education and other sectors in Punjab. As part of the Vigilance Awareness Week, the subdivisional office of the Income Tax Department organised an awareness camp for local residents at Sanatan Vidya Mandir Senior Secondary School today, which was chaired by Mr S.N. Sharma, ITO, Malerkotla. The local administration yesterday started a special orientation course for its staff. The week-long training is being given by Mr Anil Batra, a leading counselor of the Hero Mindmine. Mr Anil Batra employee as a person. 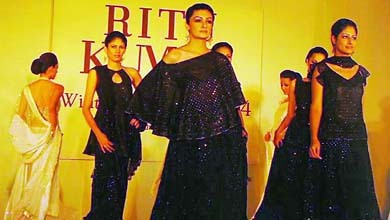 Ritu Kumar’s winter collection was showcased by 14 models on the ramp at a hotel here today. The models sashayed down the ramp wearing colourful long shirts and crinkled tissue lehngas. Quest Infosys, regional learning and facilitation Centre of Punjab Technical University, held a seminar today for IT students at Feroze Gandhi Market Centre. The Khalsa College for Women, Civil Lines, Ludhiana, achieved a rare distinction as it was awarded A+ grade by the National Assessment and Accreditation Council. Aiming to inculcate awareness among students on free legal aid and the process of availing it, a lecture was organised in Ramgarhia Girls College focussing on 'Free Legal Services and Lok Adalats'. Dayanand Medical College and Hospital is coming up with a hostel for B.Sc. nursing students on the old DMC campus. With a view to spreading awareness among masses on AIDS and drug addiction Punjab National Bank sponsored a motor cycle rally of NCC cadets of Government College, Talwara. Punjab Agricultural University is hosting a workshop of ITSAP at Ludhiana from November 9 to 11 on ‘Sustaining agriculture — problems and prospects’. The Sessions House in Ludhiana was today swarmed by the judges, advocates and close family friends greeting Mrs Manjit Kaur on the appointment of her husband, the District and Sessions Judge, Mr Baldev Singh, as a Judge of the Punjab and Haryana High Court. Breast reconstruction has become a reality, bringing hope for millions of women across the world who lose their breasts for various reasons. Bhavanjeet Kaur of Government School, Gungrali, won the 3000m race in the girls under-17 category on the penultimate day of the District Schools Athletics Meet being organised by the District Schools Tournament Committee at Guru Nanak Stadium here today.